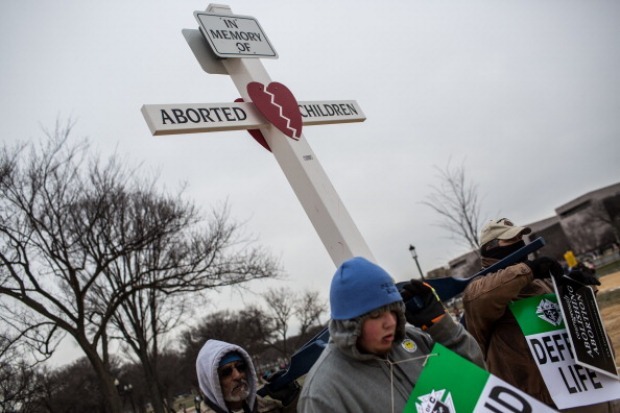 Pro-life advocates faced frigid temperatures as they participated in Friday's annual March for Life, an annual demonstration that coincides with the landmark U.S. Supreme Court decision that created a constitutional, nationwide right to abortion. The day began as more than 18,000 attended a mass Friday morning at the Verizon Center. The mass attendees then marched down to the National Mall, where they met with more participants for a rally at noon on the National Mall. The demonstrators, carrying signs with messages such as "Defend Life" and "Defund Planned Parenthood," shouted chants including "Hey, Hey, Ho, Ho, Roe v. Wade has got to go." They packed the National Mall and surrounding streets for the March of Life before marching to the Supreme Court. Last year's attendance was estimated at 400,000, and organizers said they expected even more this year to mark the 40th anniversary of the court's decision on Roe v. Wade. 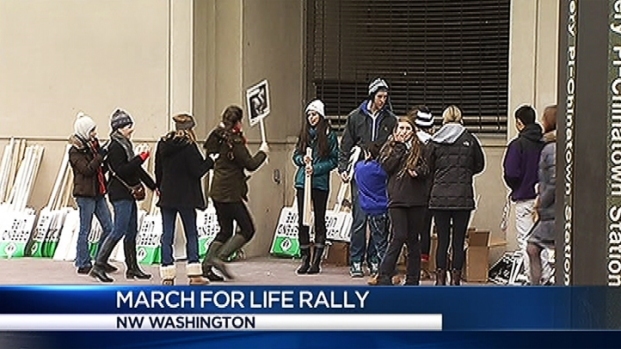 Pro-life advocates faced frigid temperatures as they participated in Friday's annual March for Life. "I just felt this 40th year marked a huge anniversary for the law," said one demonstrator, Pam Tino, 52, of Easton, Mass., who also participated several years ago. "Forty is a very important year in the Bible as well, in terms of years in the desert. And I just felt like maybe this year that was going to be something miraculous that might happen. We might see something going forward with the cause." It remains a divisive issue with no dramatic shift in viewpoint on either side; a new Pew Research Center poll finds 63 percent of U.S. adults opposed to overturning Roe, compared to 60 percent in 1992. Earlier this week, abortion opponents marked the anniversary with workshops, prayers and calls for more limits on abortion rights. And even as Obama this week reaffirmed his commitment to "reproductive freedom," state legislatures continue to consider varied restrictions on a woman's ability to receive an abortion. He recalled the love and support the country showed for his young daughter, Bella, who was born with a serious genetic condition and whose illness led him to take some time off from the campaign trail. He cited his daughter's life -- "she is joyful, she is sweet, she is all about love" -- as a reason to discourage abortion even in instances when women are told that it would be "better" for their unborn children to have one. "We all know that death is never better -- never better. Really what it's about is saying is it would be easier for us, not better for her," he said. "And I'm here to tell you... Bella is better for us and we are better because of Bella." Reps. Chris Smith of New Jersey and Diane Black of Tennessee also spoke at the event. "There's God's law and man's law," he said. "But I follow God's law first. Like it says right here, thou shall not kill. That's the end of the story. We need to protect these children."